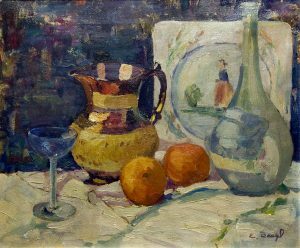 Painter, Emma Baegl was a frequent exhibiting member with the Lincoln Artists’ Guild, often showing still lifes. She was born in Lincoln, Nebraska to German parents, Barbara and John Baegl. Her father’s jobs were described in census records variously as ‘laborer,’ ‘fireman,’ and ‘boiler washer.’ Family homes in Lincoln were successively at 114 L Street, 213 South 2nd Street, and 201 North 25th Street. Emma lived most of her life in Lincoln with the exception of several years in the 1930s when she lived in a boarding house in Illinois. She worked as a stenographer in Oak Park, and attended the School of The Art Institute of Chicago. Living to 102, Emma Baegl died in Lincoln and is buried at the city’s Wyuka Cemetery. The Museum of Nebraska Art has one work by Emma Baegl. Nelson, Jon, Personal Interview, Oct. 17, 2014. He was Assistant to the Director of Sheldon Memorial Art Gallery (now Sheldon Museum of Art) from 1966 to 1981, and from 1981 to 1991, Curator of the Great Plains Art Collection at the Center for Great Plains Studies, University of Nebraska-Lincoln, both Lincoln, Nebraska.